What do mountain lions, pumas, panthers, and catamonts have in common? These are but four of more than a dozen names given in the United States to the same animal, Felis concolor. When out and about in nature, we generally refer to plants and birds by their common names, but such names can be misleading. Crayfish, starfish, silverfish, and jellyfish are not related to each other and are not fish. Classification goes back to ancient times. Aristotle grouped animals based on their mode of reproduction, while Theophrastus classified plants by their uses and methods of cultivation. In his first edition of Systema Naturae (1735), the Swedish botanist and physician Carl Linnaeus introduced a new approach to taxonomy (the science of naming and classifying plants and animals). First, he assigned latinized names to plants and animals, based on a binomial nomenclature (genus and species) that uniquely designated each living organism—a system that is still used. For example, the genus Canis includes the closely related dogs, wolves, coyotes, and jackals, with each unique member assigned a species name. Moreover, Linnaeus developed a multi-level hierarchical classification in which higher “ranks” would incorporate successive groups at lower levels. Related genera would be grouped into families—Canis and Vulpes (foxes) are grouped together in Canidae. Based on the Linnaean classification, the most inclusive rank was the kingdom, of which he counted two: animal and plant. The Linnaean classification assigned organisms to different categories based on their physical characteristics and presumed natural relationships, and this was predicated on the then-prevailing Biblical interpretation that plants and animals were originally created in the form that they now exist. One century later, Darwin presented convincing evidence that two extant animals or plants might have had a common ancestor or that extinct organisms may have been the ancestors of those extant. Contemporary classifications are based on phylogenetic systematics, which incorporates relationships that include both extant and extinct organisms. SEE ALSO: Aristotle’s The History of Animals (c. 330 BCE), Botany (c. 320 BCE), Darwin’s Theory of Natural Selection (1859), Ontogeny Recapitulates Phylogeny (1866), Phylogenetic Systematics (1950), Domains of Life (1990), Protist Taxonomy (2005). A signboard of Methodus plantarum sexualis (1736), a work by Georg Dionysius Ehret (1708–1770), a German botanist best known for his botanical illustrations. 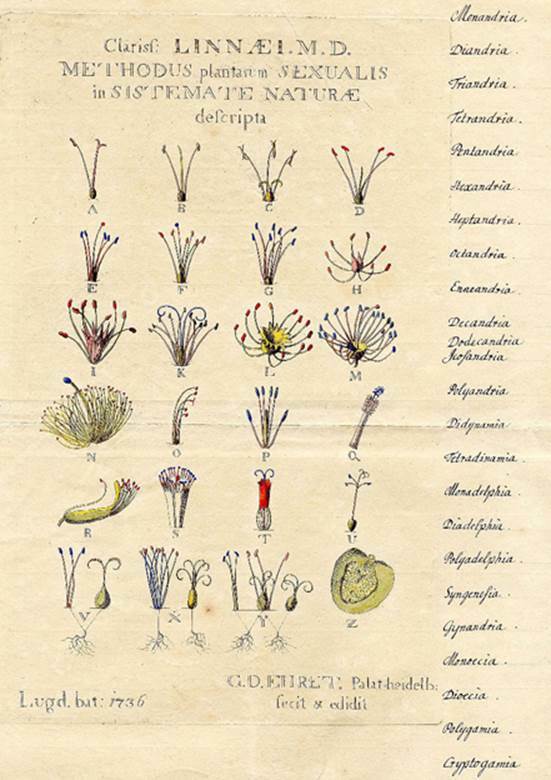 This image depicts the twenty-four classes of plant sexual systems devised by Linnaeus.